The freesheet The London Paper will be given away for the last time on Friday. The paper's closure was announced last month by News International after it recorded pre-tax losses of £12.9m. 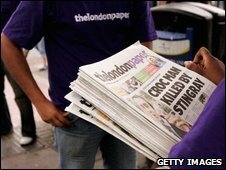 The evening paper was launched on 4 September 2006, four days after the Associated Newspapers's free paper London Lite hit the streets. It was dubbed the battle of the freesheets as publishers targeted young commuters who access news on websites and do not expect to pay for a paper. London now has three City-wide free papers. The Metro and City AM which are distributed in the morning and the London Lite. News Corporation, News International's parent company, said the paper's performance had fallen short of expectations. James Murdoch, chairman and chief executive of Europe and Asia for News Corporation, said NI wanted to concentrate on its main publications - The Sun, The Times, the News Of The World and The Sunday Times. Media analyst Lorna Tilbian said there was only room for one free evening newspaper in London and that it was much closer to the core business of Associated Newspapers than it was to News International. In July The London Paper, which was handed out outside Tube stations by vendors wearing distinctive purple uniforms, had a circulation of 500,348. But Mr Murdoch said: "The team at The London Paper has made great strides in a short space of time with innovative design and a fresh approach but the performance of the business, in a difficult free evening newspaper sector, has fallen short of expectations. "We have taken a tough decision that reflects our priorities as a business." Westminster City Council had threatened legal action against the distributors of the papers after they created four tonnes of waste a day. The two publishers agreed to meet some of the costs of recycling and put in measures to tackle the problem.